Materials: White painted metal frame and brass parts. 9 hand blown crystal bubble glass “Tulipan” tulip/onion bulbs. Metal sockets. 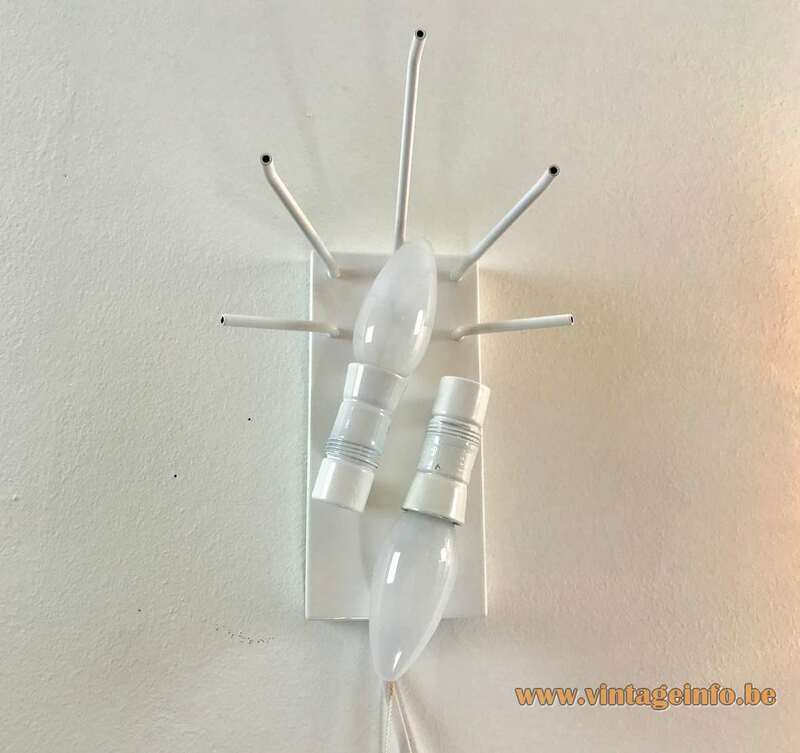 Electricity: 2 bulbs E14, 2 x 40 watt maximum, 110/220 volt. Any type of light bulb can be used, not a specific one preferred. However, small clear light bulbs gives the best result. Manufacturer: Kalmar Franken KG, Vienna, Austria. 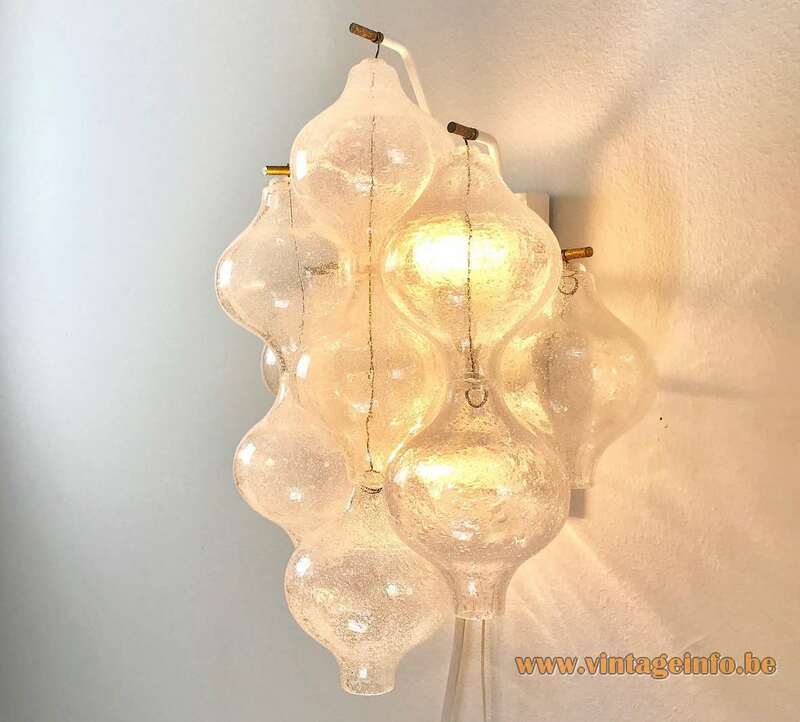 Other versions: Also made as chandelier, ceiling lamp, flush mount and many other types of lamps. From small to big lamps in all forms and sizes. 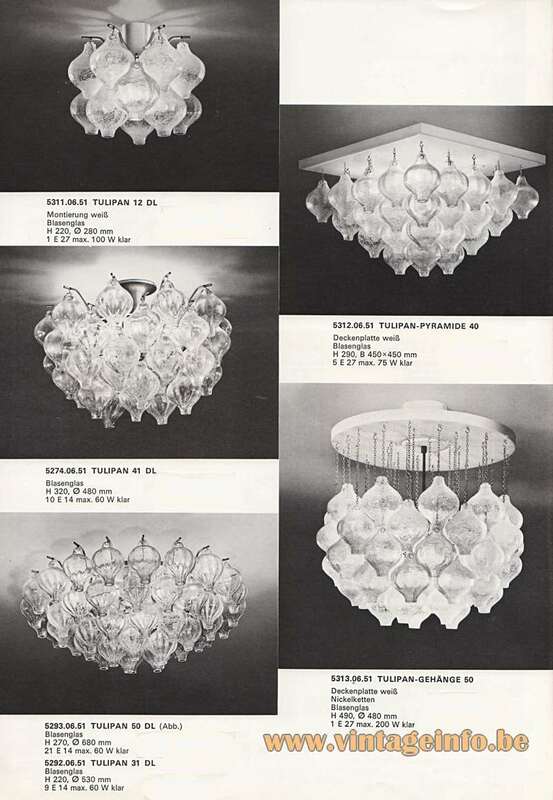 You can find the Tulipan lamps and many others in a catalogue here on Vintageinfo: J.T. 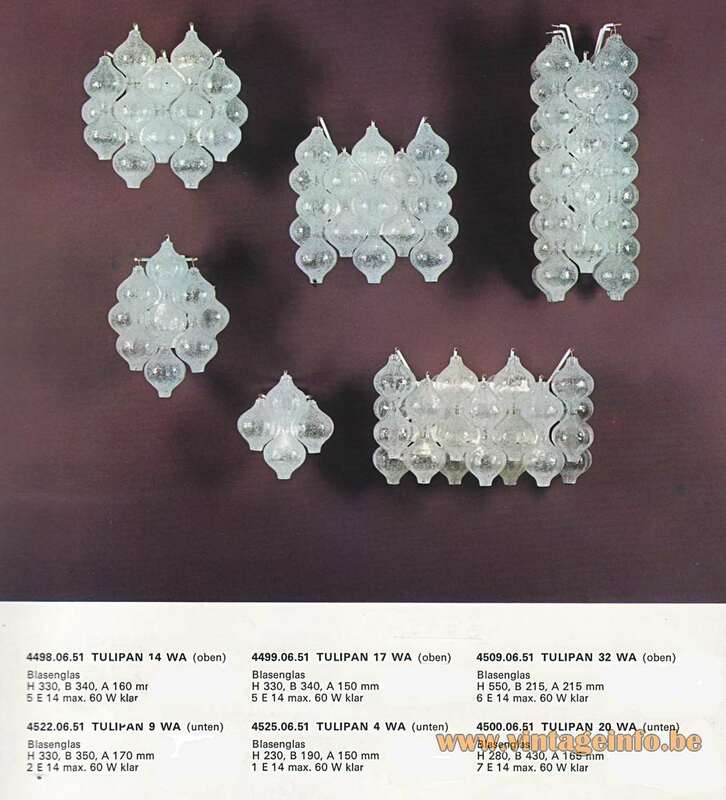 Kalmar KG, Franken KG – Catalogue 1972. 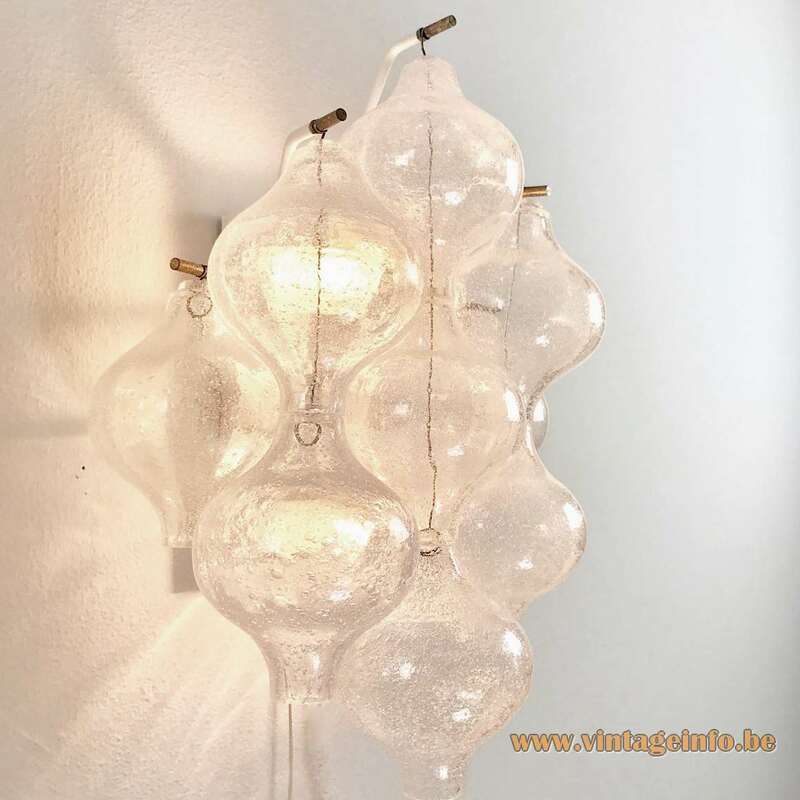 In all probability the glass for these wall lamps is hand blown in Murano, Italy. 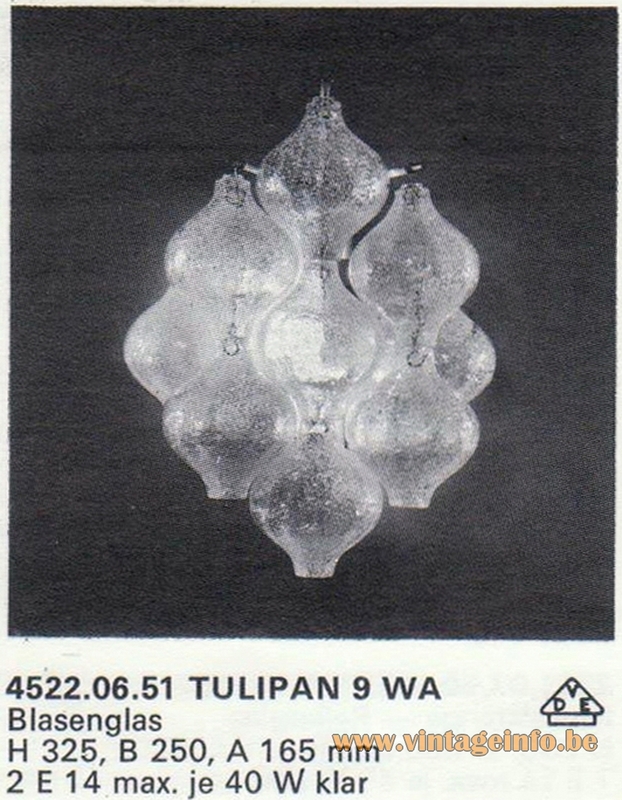 Kalmar used glass for many other lamps produced by the AV Mazzega company from the Venetian island. 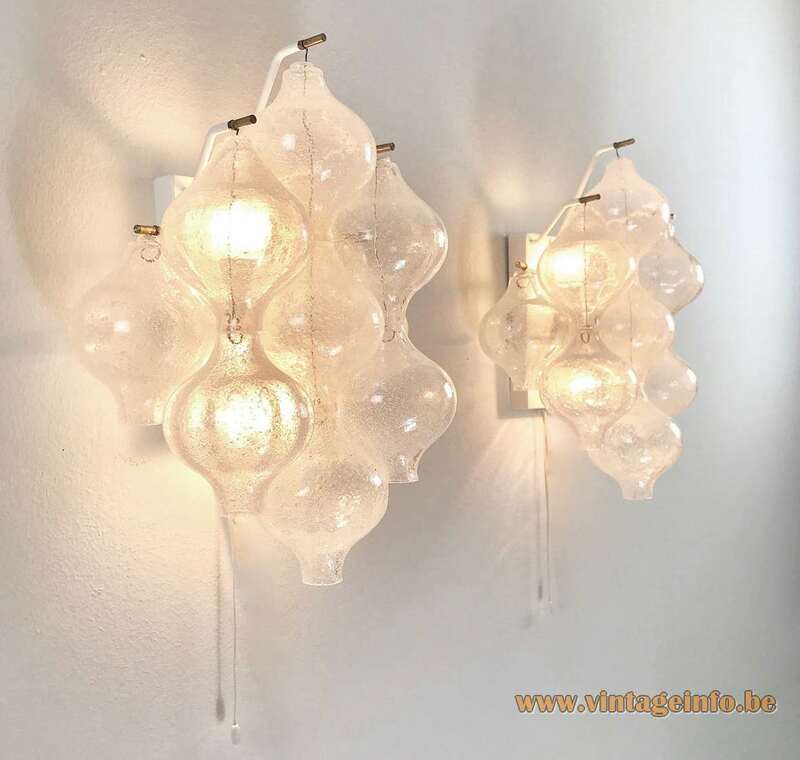 These glass tulip bulbs are made with small bubbles inside the glass. The technique is named pulegoso. Italian word taken from the dialect word pulega, which means bubble. The glass is containing numerous bubbles of all sizes, produced by adding bicarbonate/soda, gasoline, or other substances to the glass. The bubbles make the glass semi-opaque and give the surface an irregular texture. The technique was developed in the 1920s by Napoleone Martinuzzi (1892-1977) on the island of Murano, Italy and used for the first time by the famous Venini company. Founded in Vienna by Julius August Kalmar in the 1880s, Kalmar first specialized in the production of hand crafted objects of cast bronze. 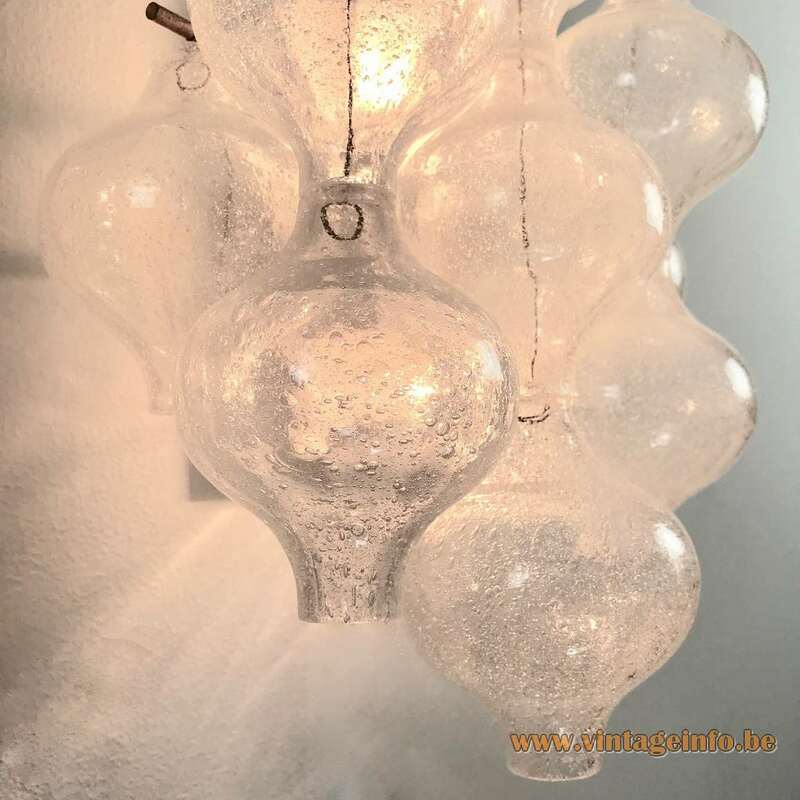 The company soon established its practice of closely collaborating with prominent architects to create chandeliers and other cast bronze objects in Austria, Europe and the United States. Before long it was presenting custom-made wares at international exhibitions such as the 1888 Vienna Trade Exposition (Gewerbeausstellung Wien). The 1893 Chicago World’s Columbian Exposition. The 1901 Export Exposition Scandinavia and the 1906 Austrian Exhibition in Earl’s Court, London. After the turn of the century, Julius Theodor Kalmar, son of the original founder, studied under the renowned Austrian architect and designer Josef Hoffmann at the Vienna School of Applied Arts and the Birmingham School of Art and Design. Inspired by Josef Hoffmann and the arts and crafts movement of the era, Julius pushed the company in a new direction away from the eclectic style of the late 19th century. And in 1925 Kalmar designs began selling in Haus und Garten, an avant-garde shop for home furnishings founded by architects and designers Josef Frank and Oskar Wlach. The shop was to become a main venue of modern Austrian interior and lighting design. It has a trademark in the promotion of Viennese design abroad. 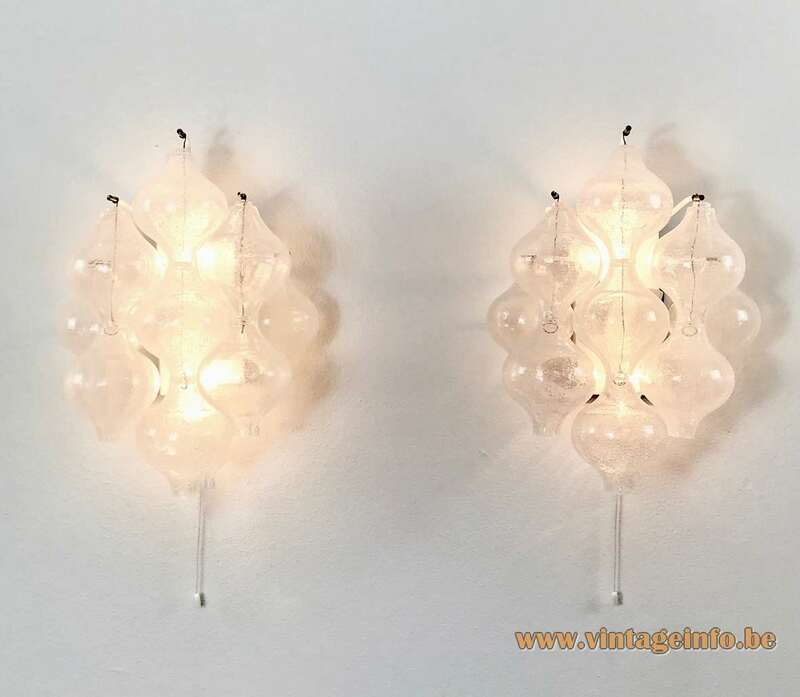 By 1931, Kalmar was concerned solely with designing and manufacturing high quality lamps and fixtures in cooperation with the architects of the Austrian Werkbund, an association of artists, craftsmen, architects and manufacturers founded in 1912. Their purpose was the promotion of a high regard for material, form and function in the hand crafted as well as industrial production of fine art and applied arts. They sought modernity by combining classical tradition and contemporary innovation. Recognized as a typically Viennese style by the 1930s, this “moderate modernity” integrated the ornament-stripped purism of Adolf Loos with more traditional elements. Thanks to the younger Kalmar’s involvement and personal acquaintance with the leading European architects of the day, the name Kalmar became associated with high quality modern design. The company flourished, producing light fittings for prominent Austrian architects and designers including Frank and Wlach. As well as Oskar Strnad, Clemens Holzmeister, Oswald Haerdtl, Ernst Plischke, and others. As the company grew, the size and scope of its contracts increased. And soon it was producing chandeliers and major installations for clients such as the Vienna Opera, the Burgtheater, the new theaters in Linz and Salzburg and the Vienna stock exchange. 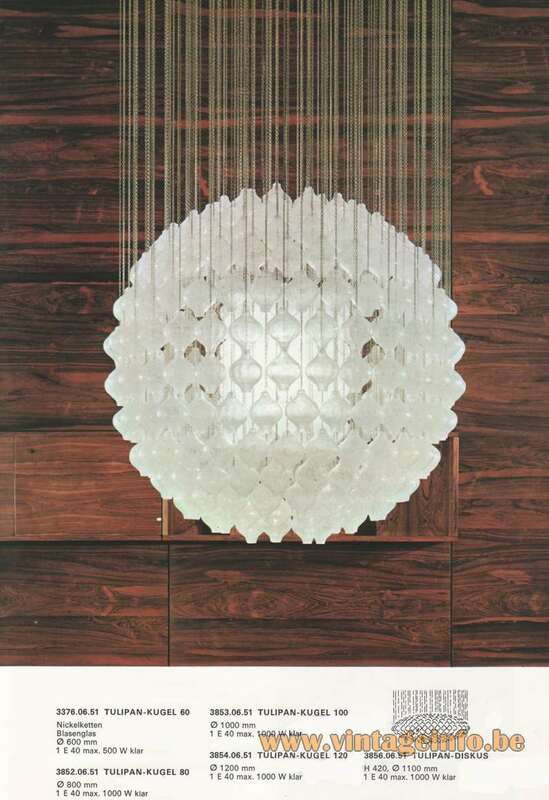 During the 1960s and 70s, Kalmar became increasingly involved in the production of decorative glass objects. Initially designed for the retail market, the company’s mouth-blown and molded relief glass elements offered vast decorating possibilities in large or small areas. As a result, the demand for Kalmar installations grew steadily. The company became more widely known among international design and architecture professionals. In the 1990’s, the great-grandson of the founder, Thomas Calice, shifted the company’s focus to international lighting projects. He phased out Kalmar’s own product lines and concentrated the company’s resources on the production of decorative, functional and technical lighting installations. The company has expanded in this specialized area and now produces prestigious custom designed and manufactured lighting installations throughout the world. In recent years Kalmar has produced major lighting installations for government buildings and palaces, museums, theaters, hotels and cruise ships. These projects include the Presidential Palace of the Kremlin. The State Tretjakov Gallery in Moscow, the new Shanghai Grand Theater. Hotels including the Ritz Carlton in Berlin, Doha and Osaka. The Grand Hyatt in Dubai, the W-Hotel in Doha. Shangri-la hotels in Abu Dhabi, Beijing and Suzhou. The Hilton in Adelaide, Bahrain, Bangkok, London and Seoul and the Sheraton in Cairo, Frankfurt and Stockholm. As well as cruise ships such as Royal Caribbean International’s Voyager, Freedom and Genesis class ships and the Cunard Line’s RMS Queen Mary 2 and MS Queen Victoria. In addition to the Dubai and Jeddah Airports, the Burj Tower and the Qatar Education City Convention Center. *In collaboration with Jonathan Browning Inc., a producer of highest quality lighting for interior designers and architecture firms, Kalmar Werkstätten, a sub brand of Kalmar, is currently offering reproductions of a series of seven historic designs based on Kalmar drawings to some of their American clients. Their distinct, simple elegance clearly evokes the essence and spirit of the Austrian Werkbund. Kalmar will also be marketing these designs in Europe, the Middle East and Asia. In addition, United Designers Ltd, an award winning, multidisciplinary consultancy based in London has adapted a selection of Kalmar designs for marketing in 2009. In march 2016 United Designers Ltd was dissolved after 22 years. Last accounts were made up to 31 March 2011.